In the short term, speeding seems like a great tactic—as a driver, you get the delivery there faster, demonstrate responsiveness to a service call and rack up more mileage per hour of work. In the long term, it is a terrible idea. The aggregated risk is simply not worth the purported benefits. This is especially an area of concern for fleet managers. But what can you do? With real-time telematics data, you can identify the drivers who engage in risky behavior. Here are five ways you can manage speeding to reduce financial and liability risk to your fleet while getting optimum performance from your drivers. With a Driver Scorecard, you get key metrics on all your operators in one place, from travel time to speeding events, in one consolidated view. You can evaluate individual drivers and compare groups of drivers to identify good and bad trends in driver behavior. You can also pinpoint long-idlers, late starters and drivers who leave work early. While all these actions are undesirable, speeding is the most obvious way that drivers increase the risk of an accident or undue wear-and-tear on the vehicle. A few miles over the speed limit may not warrant an intervention. However, ten miles per hour or more over is a concern and it could indicate a host of issues from job routing to traffic issues. You can monitor general traffic speeds, construction events and road conditions on the map to help route drivers around slow spots. If speeding becomes more of a norm than an exception, you can coach and provide additional training of drivers using the information from the driver and operator performance reports. As we discussed in a previous blog post, drivers don’t always react with enthusiasm to the news that their behavior will be monitored. To prevent undesired attrition, it’s a good idea to make it clear to your drivers that the program is more about the carrot than the stick. When you reward good drivers publicly, it makes the program into a game that drivers can compete to win rather than a race to avoid harsh penalties. By emphasizing that the focus is on safety and performance rather than any one driver’s personal habits, you can foster a sense of ownership in the team and help them see that pulling together is key in establishing success for everyone. This tactic can make your company a place where people want to work. A geozone is a virtual boundary that defines a specific area on the map. There are multiple uses for this handy telematics tool. Typical locations defined are around a fleet yard, inventory depot and off-limit areas. However, you can also set these boundaries in places where speed limits might change due to factors such as construction or school zones. These areas can then be setup to trigger alerts when exceptions occur or vehicles move in and out of the zone. Geozones are not just about monitoring driver behavior. You can use them to plan routes around known traffic bottlenecks, such as school zones during drop-off and pick-up times or events with street shutdowns. When drivers are less worried about getting to an appointment on time or returning to the yard, speeding becomes a less attractive option. These five simple techniques are easy to implement with fleet telematics. The benefits? Access to information from the road can help reduce aggressive driver behavior, improve safety and save your company money. 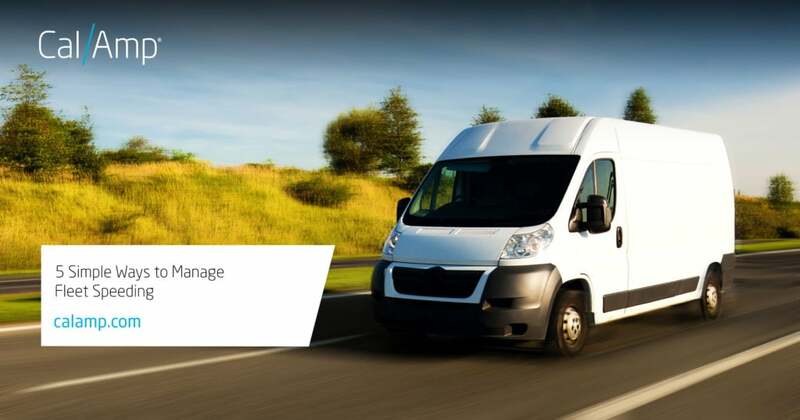 To learn more about how CalAmp can help you manage your fleet better, visit our solutions page for commercial fleets here.